Not too far from Jaco, there is a spectacular world of natural beauty to be discovered on our pulsating ATV tours. The ride takes you through jungles, steep hills, valleys, rivers, waterfalls, and rainforests. Take a break for a dip in crystal-clear pools and to bungee-jump. Round off the trip with a lunch at a ranch-style restaurant. Gear up for pulsating 3-hour off-road ATV ride into the Costa Rican countryside. A Royale ATV Adventure is the best way to explore the myriad Costa Rican landscape as it opens up less-known facets of this beautiful country and its people. You will explore enchanting jungle farms, hills, valleys, waterfalls, and even catch a glimpse of Costa Rica’s iconic volcanoes. With ATV in the mix, it becomes a kickass adventure. A bilingual guide will give you basic lessons in safety so you will be fully prepped. With the guide leading your pack from the front, there’s no fear of getting lost in the wilderness either. On arrival at your destination, you will be treated to refreshing tropical fruits. ATV tours are for those adventure-hungry travelers who don’t want to leave any location untouched even if it is in the remotest area. 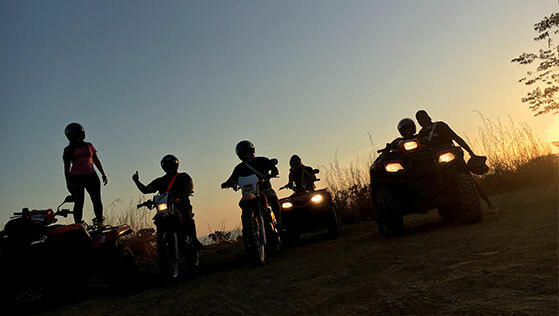 No matter how demanding the routes are, Jaco Royale arranges you the best and most comfortable ATV tours that are well suited for beginners as well as the experienced riders. We offer private tours which you can enjoy thoroughly with your closed circle and also provide you with a bilingual guide to assist you well through any concerns. Take a step closer to heaven and soak yourself in the natural hot springs as we take you to a 3 hour ATV tour to the rainforests in our highly comfortable vehicle. As you pass closer through the rich rainforests, you witness the best of nature, mountains, waterfalls, and plantation for a serene, pure and rejuvenating experience. We have highly maintained fully automatic vehicles with smart features to make your tour a relaxing activity.